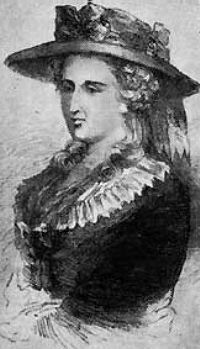 English novelist, the only daughter of William and Ann Ward, was born in London on the 9th of July 1764. She was the author of three famous novels: The Romance of the Forest (1791), The Mysteries of Udolpho (1794) and The Italian (1797). When she was twenty-three years old she married William Radcliffe, an Oxford graduate and student of law. He gave up his profession for literature, and afterwards became proprietor and editor of the English Chronicle. After The Italian Ann gave up writing for publication, and was reported to have been driven mad by the horrors of her own creations, but the nearest approach to eccentricity on Radcliffe's part was dislike of public notice. Of scenery Radcliffe was an enthusiastic admirer, and she made driving tours with her husband every other summer through the English counties. She died on the 7th of February 1823. In the history of the English novel, Radcliffe holds an interesting place. She is too often confounded with her imitators, who vulgarized her favourite "properties" of rambling and ruinous old castles, dark, desperate and cadaverous villains, secret passages, vaults, trapdoors, evidences of deeds of monstrous crime, sights and sounds of mysterious horror. She deserves at least the credit of originating a school of which she was the most distinguished exponent; and none of her numerous imitators approach her in ingenuity of plot, fertility of incident or skill in devising apparently supernatural occurrences capable of explanation by human agency and natural coincidence. She had a genuine gift for scenic effect, and her vivid imagination provided every tragic situation in her stories with its appropriate setting. Sir Walter Scott wrote an appreciative essay for the edition of 1824, and Christina Rossetti was one of her admirers. She exercised a great influence on her contemporaries, and the "Schedoni" character in The Italian is one of the prototypes of the Byronic hero.